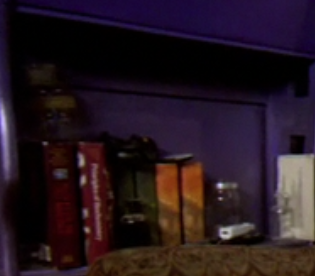 One of my fellow Horrible fans called to ask if I could tell what was on the bookshelf in Act2 @ 12:38. We determined that Billy is a Harry Potter Fan. A Wii-mote! Horrible and Moist in a fierce match of Wii Bowling. You know you want to see it! According to the folks over at LibraryThing, the first book is James S. Walker's Physics, and the second is Albert L. Lehninger's Principles of Biochemistry. Great sluthing. Is that a couple of cans of Amp on the shelf that is to the left and down one?